The so-called “elites” in Tinseltown laughingly believe they should be the nation’s “moral compass,” and that those who don’t believe what they do are “backward.” These “elites” align with socialist-Democrats at almost every turn and attack President Trump for putting America first & making it great again. Sunday night, the Hollywood Foreign Press Association held the annual Golden Globe Awards. As to be expected, some attending disparaged President Trump & his supporters, specifically over the issue of the wall Trump has promised to have built on the southern border. Despite the evidence being right before their eyes that we need border security & a wall which the Border Patrol says works to keep us safe, Hollywood leftists scream that a wall is immoral. At the awards show on Sunday, producer Brad Simpson accepted an award for his TV series, “The Assassination of Gianni Versace: American Crime Story.” After accepting the award, Simpson went on to trash supporters of the wall & President Trump as “forces of hate and fear” and called for Hollywood to “resist” them. At least two prominent speakers argued against building walls [Brad Simpson being one], in the second week of a government shutdown triggered, in no small measure by Trump’s demand for money to build a wall along the U.S.-Mexico border. “Mexican director Alfonso Cuaron, won two awards for his film “Roma,” about an indigenous woman housekeeper working in an affluent, but broken, Mexico City home. The winner for Best Director and Best Foreign Language Film told the crowd his view of the power of film. Cuaron spoke in Spanish in portions of his speech, to which one Twitter user remarked that he hoped Republicans are dying over it. Triple-amputee vet Airman Brian Kolfage is an American hero who has been fighting to have a wall built on our southern border, and in 3 weeks he has raised almost $20 million to do it. Kolfage took on Simpson, Cuaron, & other Hollywood “elites” who want open borders and say that wall supporters are racist haters. 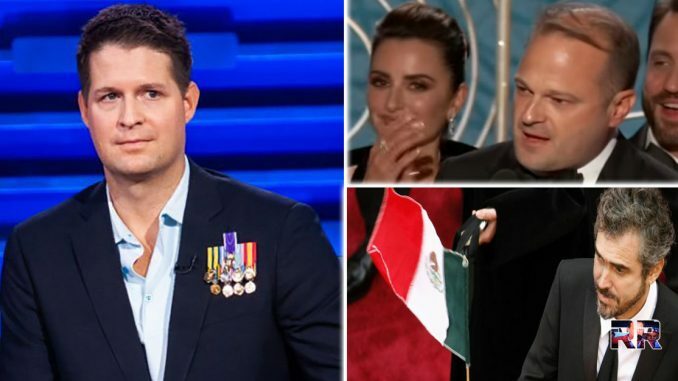 Airman Kolfage is correct, the Golden Globes are out of touch with most Americans on issues such as the wall, which is why the show’s ratings are diving. “Even with a big NFL lead-in, two likable hosts, and a seeming moratorium on Trump bashing, the Golden Globes found itself losing even more viewers. Kolfage also correctly noted that our country was built on LEGAL immigration, a fact that the left in Hollywood hate. They are part of the socialist-Democrat crowd that wants open borders, sanctuary cities, and to abolish ICE. They care about illegals more than American citizens, which was evidenced by their silence after the killing of the California cop by an illegal immigrant the day after Christmas. Share this if you support Airman Kolfage & want a Wall! This article was written by Jeff Rainforth for RightWing.news and originally appeared here. It was republished with permission.